The city of Pistoia is an easy day trip from Florence, but in 2017, it is set to become a destination of its own. Located in Tuscany about 19 miles northwest of Florence, Pistoia was named as a top 10 city to visit in 2017 by Lonely Planet and the 2017 Italian Capital of Culture by the Italian government. According to Lonely Planet, Pistoia was awarded the recognition for its thriving small-town culture, local entrepreneurial spirit, and grassroots philosophies. As an Italian Capital of Culture, cities receive funding from the government to preserve and restore their heritage and culture. A total of 1€ million will go toward several projects in Pistoia, including creating bicycle paths, upgrading the Palazzo Fabroni modern art museum, restoring the city’s walls and renovating the Ospedale del Ceppo, a 15th-century hospital. Like Florence, Pistoia is a charming city with an abundance of art and architecture, but is quieter than the Tuscan capital. It attracts visitors with plenty of art, culture and food attractions: medieval churches, beautiful piazzas, historical sites and major art events such as the summer Pistoia Blues festival. Nearby, the Apennine Mountains entice snowbirds with skiing in the winter. The city’s Duomo cathedral, also known as the Cattedrale di San Zeno, has the same green-and-white marble color scheme as Florence’s Duomo, but with its own distinct beauty. The cathedral was built in 1311 and has seven arches on its striped façade, and has a beautifully decorated interior. 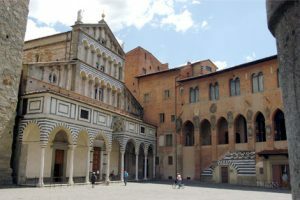 Also in Piazza Duomo are the cathedral’s baptistery and campanile and the Palazzo del Comune, a museum of paintings from the 13th to 18th centuries housed in a palace that once belonged to the Medici family. The Ospedale del Ceppo was founded in 1277 and played a key role in helping Tuscans affected by the Black Death in 1348. Today, it explains the history of hospitals in Tuscany and hosts underground tours. At the Palazzo Fabroni, visitors can explore modern and contemporary art, including new and changing exhibits by international and emerging artists. Chocolate lovers will swoon over the classic sweets in Bruno Corsini, including confetti (candy-coated almonds). In one of the main squares, Piazza della Sala, shoppers can peruse the outdoor market stalls, which have been selling produce, meat, and flowers since the 11th century, and can also sit back and enjoy a glass of wine and dinner after dark.